At the current growth rate, the Government National Mortgage Association (GNMA) known as “Ginnie Mae” will overtake Freddie Mac within the year as the second largest single-family mortgage securitization platform. In May, Ginnie Mae’s book of business hit $1.5 trillion, more than tripling over the past seven years. This milestone affirms that financing through liquid, standardized securitizations has allowed the government to successfully implement a critical countercyclical role. But how does Ginnie Mae differ from the government sponsored enterprises (GSEs) and why has its remarkable growth been critical to the post-crisis stabilization of the mortgage market? Ginnie Mae provides guarantees for both single-family and multi-family securities and guarantees securities consisting of reverse mortgages and mortgages on manufactured housing. Ginnie Mae’s single-family business dominates, comprising $1.4 of its $1.5 trillion outstanding balance. The single-family business also overwhelmingly dominates for the GSEs. There are, however, three big distinctions between the GSEs and Ginnie Mae. The Department of Housing and Urban Development’s Office of Public and Indian Housing (PIH) with less than five percent as well. On the multifamily side, the only two insurers are HUD and RD. No credit risk. Ginnie Mae guarantees investors that the payment of principal and interest will be made in a timely fashion; the issuers servicing the loans are responsible for advancing the payments due even if the borrower defaults. Ginnie Mae steps in and makes the payment due to investors if the issuer fails to perform. If a loan defaults, the issuer is responsible for submitting a claim to the insuring or guaranteeing agencies (FHA, VA, RHS or PIH,) making the payments while the claim is being processed, and for any amount not covered by the claim. So Ginnie Mae is essentially in a fourth loss position, behind the borrower, the government insurance provider and the servicer. By contrast, the GSEs are both insurers and securitizers. As such, they are in a second loss position. If the borrower does not pay, the GSEs are next in line and, therefore, have the credit risk on the securities. Explicit government backing. Ginnie Mae securities have the explicit full faith and credit guarantee of the US government. The GSEs have historically had only an implicit guarantee until the 2008 conservatorship made the guarantee explicit. After the financial crisis, the share of loans insured by the government increased rapidly. 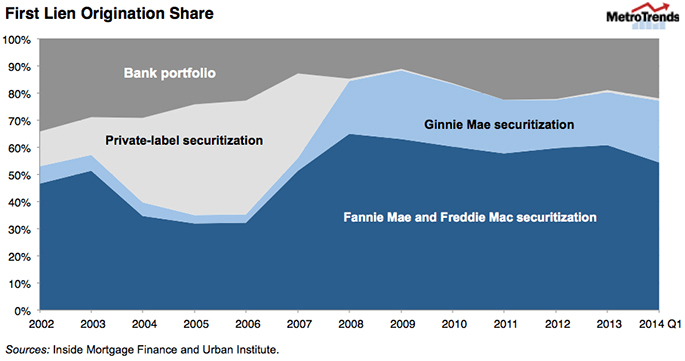 Ginnie Mae’s single-family securitization simultaneously grew at an extraordinary pace, much faster than the GSEs. In 2007, Ginnie Mae’s $445 billion book of business was small relative to both entities, but today, its $1.5 trillion guarantee book is only slightly smaller than Freddie Mac’s $1.6 trillion. If these rates continue, Ginnie Mae will overtake Freddie Mac within a year as the second largest single-family securitization platform. Today’s private label securitization market is a fraction of its former self, and bank portfolio holdings are an even smaller share of total originations than before the crisis. Government insurance and guarantees (both implicit through the GSEs and explicit through FHA, VA, and RHS) stepped in to pick up a good part of the difference. Borrower reliance on explicit government insurance and guarantees through FHA, VA, and RHS has experienced the fastest growth, and FHA has been the primary source of mortgage credit availability for borrowers with less than pristine credit. Without Ginnie Mae and its full faith and credit guarantee, the government insurance programs could not have played such a critical countercyclical role and the downturn in home prices would have been much more severe. If investors, overseas and domestic, private and public, had been unwilling to take interest rate risk through Ginnie Mae and GSE securities, the real estate market would have sunk much further. Ginnie Mae may be the GSEs’ less famous cousin, but its tremendous value cannot be disputed. Great article - concise and timely. I have two questions. 1. Are issuers of Ginnie Mae securities usually also the servicers? 2. We observe that banks are selling the mortgage servicing rights to non-banks. With regard to the servicer's ability to advance the payment in the event of borrower default, what is the risk posed by non-banks to Ginnie Mae?